We have a lot of new people joining the community, and if you're like me when I started posting my MOCs online, you have absolutely no idea how to photograph or edit your photos to make them look good! To begin our discussion, we'll start with what is, in my opinion, the single most important aspect of taking good photos: Lighting. Lighting is critical because the camera needs adequate light to "see the image" and take a good photo. Even if you have a really nice camera, insufficient lighting will likely cause your photos to come out blurry and/or grainy. There are two types of lighting: Natural and artificial. In both cases, you'll typically want to utilize indirect lighting. For those of us without access to a nice lighting setup, utilizing natural lighting is generally our best option. Somewhat opposite of nature photography, when taking pictures of Lego, you aren't necessarily looking for lots of shadow or contrast. You just want a nice clean photo of the subject material. Since we are looking for indirect/semi-flat light, your best lighting will come on a bright, but overcast day. A white/beige room with plenty of windows is good for an indoor setting, but the best when using natural light would be to take the picture outside. Try to take the pictures near midday, since that's both when the light will be brightest, and also when the sun will be most overhead, which will reduce the amount of shadows on your MOC. If you have some white posterboard that's large enough to serve as a backdrop, that will help to bounce some of the light onto the MOC as well (more about backdrops further below). Artificial lighting is the preferred light source for most FOLs, because it is consistent and not weather/time-dependent. 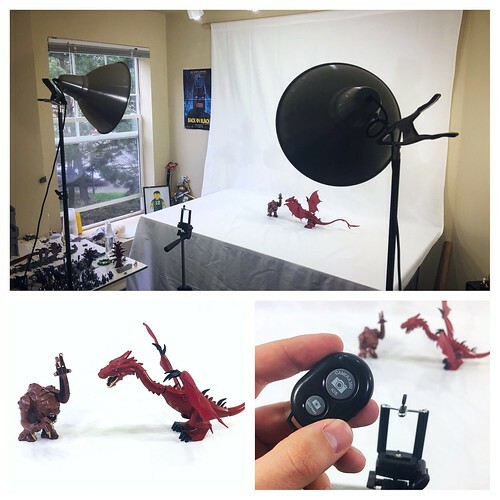 A good lighting setup can be as inexpensive or as pricey as you want to make it. For the purposes of this tutorial, we'll stick with just providing some tips that are applicable for any budget level. The main factors you want to consider for artificial lighting are what type of bulb to use, and how to achieve the proper light levels. First, I recommend investing in a pack of "daylight" bulbs, which have a more natural white light "temperature" compared to your average light bulb. Your normal household light bulb typically has a warmer yellowish tint, which will affect the color of your MOC in a photo. Personally, I like to use LED daylight bulbs, because they are cooler and seem to give off a more diffused light (and are also more energy efficient). Notice that the lights are pointed at the sides of the light box, which lights the model indirectly. This helps to reduce glare, and creates more even/diffused lighting (similar to shooting on a cloudy day outside). Using a white box will help to maximize the amount of reflected light. Note that this user appears to be using warm lights instead of daylight bulbs. I prefer the starker white of daylight bulbs, but that's personal preference. Now, some models are not going to fit inside a light box, so you can try other options like putting some tissue paper in front of the lights and pointing them at the model from several angles (left, right, and above from the front are suggested). If you do this, be careful that your lights are not hot and will not create a fire hazard! (a good reason to use LED bulbs). As you can see, I have the table well-lit by overhead task lights, as well as two LED floodlights, and even an open window for additional natural light. All of the lights are "daylight" bulbs, so that the hue of the lighting is consistent among the sources. I also have positioned all of the lights far enough away that by the time the light hits the subject material, it is somewhat diffused and doesn't produce too much concentrated glare. Finally, I have a tripod and bluetooth shutter control to help keep the camera stable during photos. This is extremely important, and will help ensure your photos come out nice and sharp, instead of fuzzy and blurry. I'm unlocking this for comments. Feel free to contribute your own suggestions and I'll add the best stuff to this first post. I am pretty sure I have a few of these to finish up. Thanks for reminding me! What seems to be the specific issue with your backdrop? Your sig-fig pic looks perfect, IMO! Here is a very simple way make your backgrounds more white. It does have significant limitations, but is useful for simple fixes. Firstly you will require Microsoft Picture Manager. This used to come standard with Windows but now should be available as a free download from Mircosoft. Personally I feel the image is a bit underexposed, the best course would probably be to retake the picture using a slower shutter speed/larger aperture(smaller F-Stop). However for this example we will assume this isn't an option. Open the image in Picture Manager and crop to the desired size. One it is the right size, click on the Edit Pictures option on the top toolbar. Then select the Color option on the right Edit Pictures menu. It will be the option next to a rainbow coloured ring. At this point you should also shake your head and mock the American spelling of colour. Now you may need to adjust the Brightness contrast of the picture. The easiest way to do this is to select Auto Correct from the top toolbar. The picture will adjust. Or you can manually play with the settings if you like. In this case there is very little difference. Like I said this is the simplest way I know of adjusting the background and it only works if your original picture is fairly decent to begin with. I can suggest some more advanced ways later when I have more time if you are interested. That's an excellent quick tutorial, and great step-by-step results! I often use my iPhone to take photos and then a free app like Aviary to do something similar. Usually adjusting exposure, brightness, and contrast is sufficient to brighten up the background. A free editing program like GIMP also has similar features and can do a heck of a lot more. Arylego's program looks really great and easy to use as well! Here is another way using GIMP. GIMP is a free, powerful photo editing program you can easily download. I will caveat this with the fact I am still learning GIMP and am not very good. More experienced people than me may be able to make better suggestions. Anyway this is a method that I have been playing with for mostly black backgrounds, but it could work with white as well. Here is the original image. I'm pretty happy with the subject, but the background is killing me! Crop the image as required. Now select the Fuzzy Select Tool as shown below. Click anywhere in the background. As you can see, it selects portions of the image that it thinks match those you selected. In this case, large parts of the subject are also highlighted. This is not ideal and we need to correct it. Adjust the Contrast all the way up as shown below. The image will modify before your very eyes! As mentioned, the threshold was still too high and the contrast on the dark green leaves is terrible. If this were for real I'd CTRL Z at this point and keep adjusting until it was better. However for the purposes of this tutorial we shall push on. The background is still not quite right, but this is an easy fix. Select the Pencil Tool and make sure you have black selected as your Foreground colour. You can use the Color Picker Tool if you want to make sure you have the correct shade of black. Adjust the size of your pencil and draw over the ugly grey bits in the background. Soon you will have a uniformly black background! In the case of this picture, you will have to do some more selections and contrast adjustments to get background sections that weren't highlighted in the initial selection. This can be fiddly and take time, but the end result is worth it. Anyway here is the (for the purposes of this tutorial) finished image. As mentioned if this was for real I'd spend a lot more time playing around with it to get it right. AK_Brickster , The pedantic side of me realises these are more Photo editing tutorials and not photography tutorials, so feel free to move them if you feel somewhere else is more appropriate! I really like how you dramatically increase the contrast in GIMP instead of just changing the background color with fuzzy select tool, I'll have to try that sometime! Usually I just spend a long time with the free select tool and the fuzzy select tool cropping out the background precisely. Maybe that will be a bit faster. Thanks for the helpful step-by-step tutorials! One thing you can also do is de-select regions that the fuzzy select grabs by mistake. I think you hold down Ctrl and click on them, or switch to the free select tool and drag around them to de-select them. Same goes for grabbing areas that the fuzzy select misses. Basically you're not limited to one click and hoping that the fuzzy select gets it perfect. You can add and subtract selected areas with multiple clicks before you perform your contrast adjustment. Also, no worries about possibly diverging from the photography tutorial. I see editing as an integral part of photography!